AUGUSTA — A left-leaning group that advocates for the impoverished and poor in Maine will push state lawmakers for a minimum-wage hike again in 2015, organizers said Wednesday. The Maine People’s Alliance announced Wednesday it would host a news conference to discuss a new report, “Equity in the Balance,” which details the wages of Maine workers. The report was published by the Alliance for a Just Society, a national organization that works to address economic, racial and social inequities. Andrew Francis, a spokesman for the Maine People’s Alliance, said the group would push the Legislature on the issue in the coming lawmaking session, which starts officially in December. The state’s minimum wage is $7.50 per hour, 25 cents higher than the federal minimum wage. The issue was a divisive one for many of the state legislative campaigns in 2014, with Democrats largely supportive of a wage increase and Republicans opposed. Democrats argued a wage increase would help Maine’s lowest-paid workers and pump more spending into the economy, but Republicans said an increase would kill jobs at small businesses — the backbone of Maine’s economy. In 2014, Maine Democrats passed a bill that would have increased the state’s minimum wage to $9.50 per hour over three years, but the bill was vetoed by Republican Gov. Paul LePage and Republicans sustained the veto. The MPA’s news conference is expected to focus on the low number of women and minorities who earn a “livable wage” in Maine. Francis said Wednesday that a livable wage for a single person is about $15.80 per hour, while a livable wage for both parents in a family of four would be $19.50 per hour. LePage has said he would prefer that the state focus on bringing new jobs that pay far beyond the minimum. Republicans and Democrats generally disagree over whether the minimum wage was intended to be a livable wage or was meant to be more of an entry-level and training pay, with the expectation that workers’ wages would advance as their skills and value to their employers’ increased. Four states — Alaska, Arkansas, Nebraska and South Dakota — recently voted to increase their minimum wages. 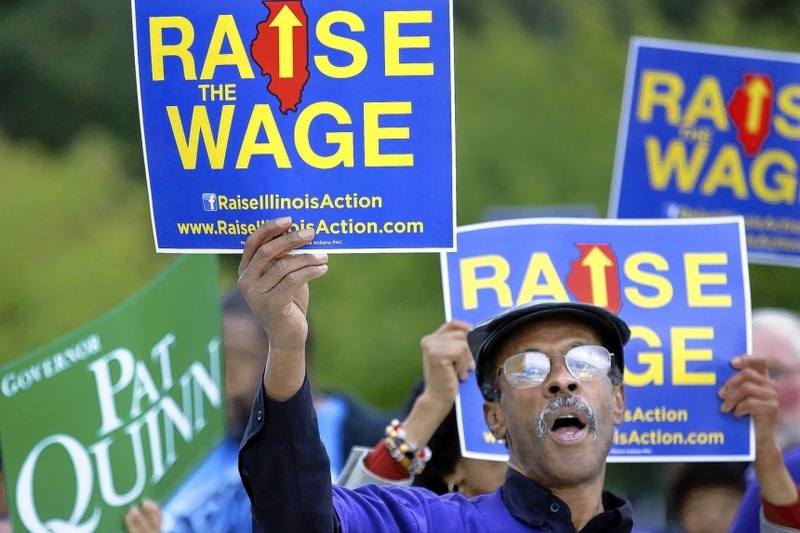 Illinois voters also approved an advisory vote that urges that state’s Legislature to increase the minimum wage there. Republicans would likely counter any proposal to increase the minimum with proposals of their own that would make Maine a so-called “right-to-work” state, which means it would be illegal to force workers represented by unions to pay dues. Democrats and the state’s large labor unions have been opposed to the proposal, saying it is little more than a union-busting measure. But LePage has been quick to note that the states with the biggest employment gains and wage increases have been right-to-work states. Republicans have also pointed to data from the nonpartisan Congressional Budget Office that suggested a federal increase of the minimum wage to $10.10 an hour as proposed by President Barack Obama could cost the U.S. up to 500,000 jobs. Mike Tipping, communications director for the Maine People’s Alliance, said barring legislative action a citizen initiative asking for a minimum-wage hike could be placed on the state ballot in 2016. Tipping noted that the four states where voters just approved increases all have Republican majorities in their legislatures. Three of the four states are also considered right-to-work states, including Arkansas, South Dakota and Nebraska. “These are all red states and it passed by wide margins,” Tipping said. He said that even if the minimum wage were not intended to be a livable wage, it hasn’t managed to keep pace with basic inflation. Adjusted for inflation, the minimum wage in Maine would be $10.50 an hour, Tipping said. If it were adjusted for worker productivity increases, it would be $22 an hour. He said that if the minimum wage were tied to the same percentage increase achieved by the wealthiest 1 percent of Americans, it would be over $30 an hour. Also in the works is a Portland City Council vote that will contemplate setting a new minimum wage for the state’s largest city. An advisory committee has recommended the city increase the minimum wage to $9.50 an hour by 2015 and to $10.68 by 2017. In all, nine states will see their minimum wages go up because of increases passed by voters or lawmakers or because of previously enacted laws indexing the minimum wage to inflation or the cost of living, according to the National Conference of State Legislatures. Matt Gagnon, executive director of the right-leaning Maine Heritage Policy Center, a Portland-based nonprofit that advocates for conservative ideas and free market policies, said Wednesday they would oppose a minimum wage hike in Maine. “It obviously sounds great when you are making your case for it,” Gagnon said. “But the practical effects of it are obviously something we would not support. He said a scenario in which Republicans compromise on the minimum wage, a high priority for Democrats and liberals, would involve a trade-off that included a high priority for conservatives, such as right-to-work legislation.